And so today comes the news that another Chinese stage race looks like being shoehorned in to the WorldTour calendar. The Tour of Hanghzou is proposed to run from October 17-21 of this year. The race was approved during a two-day meeting of the Professional Cycling Council, ending yesterday, and is likely to become the 29th race of the WorldTour calendar. In order to complete the process, the race organisers only have to apply to the License Commission, and its place at cycling’s top table will be confirmed. While the identity of the race’s organisers haven’t been confirmed, it is likely that the UCI’s own business – Global Cycling Promotions – is behind the race. If this does turn out to be true, then it will confirm the massive and obvious conflict of interest regarding the GCP. Should the sport’s governing body be allowed to promote their own races while they also organise and run the WorldTour calendar? The answer is, obviously, of course not. It opens the door for the UCI to give their own races top billing while ignoring races put on by other organisers. It is commendable that the UCI are trying to generate some extra income for the teams (at least that’s what Esteemed Leader Pat McQuaid said a few weeks ago), but then again, one could speculate that this offer is merely one to satiate the teams, and perhaps turn their heads away from a proposed breakaway league. There is, of course, no doubt that these new ventures into China are all about the growth of cycling and raising revenue for the sport, and some will argue that an equally good idea would have been to promote an already established race such as the Tour of Qinghai Lake. The difference there is that that race is held in the province with the smallest economy in all of China, generating only 0.3% of the country’s economy. Meanwhile, Zhejiang, the province in which the Tour of Hangzhou will be held, had a nominal GDP of $402 billion, over 25 times that of Qinghai’s GDP. There is a sense that maybe the UCI should try and save some of the races in Europe that seem to be struggling to stay alive though. In recent days it has been announced that the 2012 editions of the GP Herning and Giro Di Sardegna won’t be run. If the current WorldTour points system is anything to go by, the winner of this new race will earn the same number of points as the winner of Paris-Roubaix, or any of the other Monuments for that matter, and whoever gets third overall in the Giro d’Italia or the Vuelta a España. The winner of this race and Beijing also receive the same amount of points as undoubtedly tougher races such as the Critérium du Dauphiné. The WorldTour points system is something that definitely needs a radical rethinking. I have little doubt that many WorldTour teams and riders will not be too happy at the prospect of five more compulsory race days in their already-taxing seasons. Mark Renshaw has already taken to Twitter to register his disapproval at the news, while David Millar’s tweet on the subject was somewhat more tongue-in-cheek. In any case, it looks as if this race will be pushed through, and come October we should be seeing some tired legs struggle through it in the name of scrambling for some vital points to keep their team in the WorldTour for 2013. Lets hope it isn’t as mind-numbingly dull as the Tour of Beijing was. 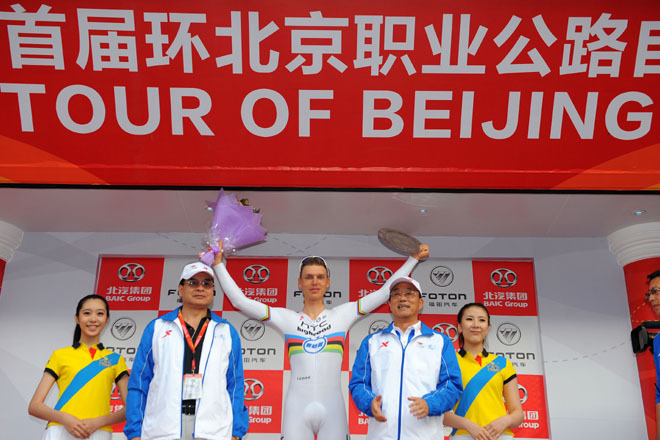 The UCI press release pertaining to the Tour of Hanghzou can be read here. And already a parody Twitter account for the race has sprung up.